If there’s one thing you should never skimp on during your travels it’s proper footwear. A nice pair of walking shoes does the trick on the streets of London, Berlin or Tokyo, but over uneven and untamed terrain your average shoe just won’t do. Getting into the wild? You’re going to need footwear that provides excellent support, keeps your stride steady, and grips the terrain forcefully. Sure, sturdy pair of hiking boots checks all the boxes. Sometimes, though, they’re simply overkill. Unless you’re planning to scale a rough mountain track, a good, comfortable pair of hiking shoes is usually all you’ll need to tackle the trails on your next adventure. Yes, there’s a certain trade-off between ankle support and durability moving from a hiking boot to low-cut hiking shoe. What you’ll gain in extra baggage room, lighter packing, and convenience will often more than make up the difference. Looking for some kicks for your male travel buddy? 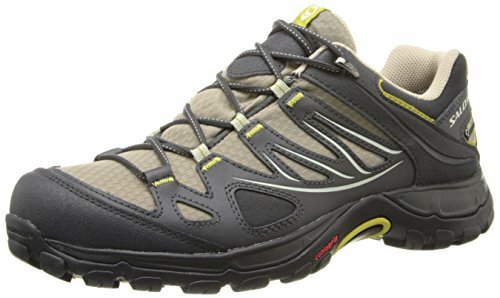 Also check out our top picks for the best hiking shoes for men! Choosing the perfect pair of women’s hiking shoes isn’t so difficult. Well, at least when you’ve got an idea for what’s lurking out there. Brands like Merrell, adidas, Columbia, The North Face, and Salomon corner much of the market, all offering their own spin on classic designs tailored for hikers. Some manufacturers lean towards a sporty, modern style, while others stick with a traditional outdoorsy feel. What you’ll need, however, probably depends more on function than looks. Features like breathability, waterproofing, support, stability, and traction differ greatly between shoes; your most faithful new footwear will be that which best matches where you’re going and what you’re doing. For each of the following products, we’ll give you an idea of who each shoe is most suitable for and where it shines best. If you’re still a little bit confused while scouring through these reviews, take a look at the quick buyer’s guide that follows to get a better idea of what to expect on your quest. Want something with more support? 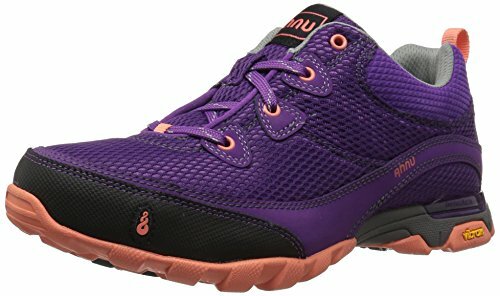 Check out our recommendations for the best hiking boots for women! 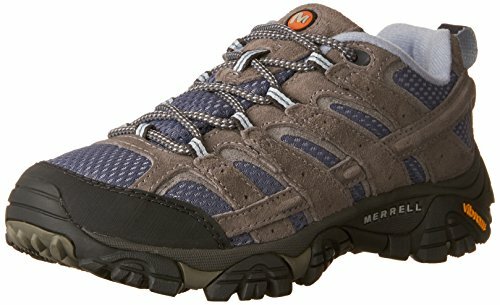 Merrell has been a popular shoe among avid hikers. And although the Merrell Moab 2 Women’s Ventilator is not cut for long distances, it’s equipped with reliable features for regular trekking. Starting with the leather and mesh upper, it oozes durability and breathability from every dimension. You can expect to hit the trails and not feel rocks nudging your underfoot all thanks to the blended EVA footbed. The footbed is also contoured to accommodate the curves of your feet. Each step is calculated as it plants you firmly when winding through rocky, mountainous paths. With a molded arch shank, the shoe acquires better stability than other sneakers in its class. It offers great value owing to the Vibram outsole that withstands heavy usage and grips the terrain reliably. Although the Moab 2 Ventilator will endure, these kicks are not waterproof. The high breathability also precludes this sneaker from being a favorite in the cold and wet winter months. Want to explore the trails in a shoe that boasts hiking prowess? Well, The North Face Hedgehog Women’s Fastpack GTX is the right pick. It carries excellent waterproofing capabilities, balancing breathability with performance in wet conditions, thanks to the Gore-Tex construction. Even better is the super-sticky Vibram outsole. It powers through mud, sharp rocks, rooty paths, and even slippery stones along streams. Comfort and stability are top-notch, too. The cradle EVA midsole gives you ample support to provide excellent arch stability. You’ll cherish the extra stability from the TPU shank that will save your ankle from sliding through mud. Better still, The North Face Hedgehog is adorned with a gusseted tongue that reliably keeps out debris and sand. It opens your world to taking beach runs seeing that the mesh upper allows only air inflow. 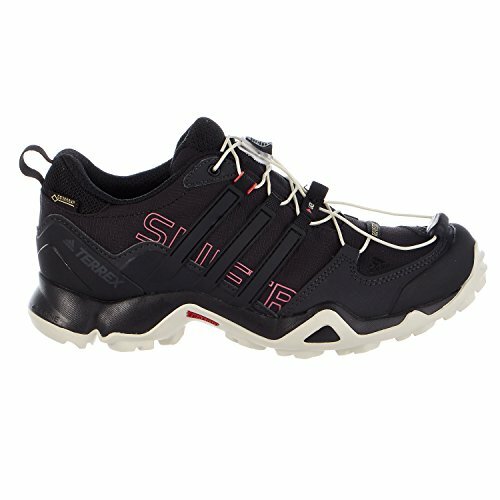 Unfortunately, this lightweight sneaker doesn’t shine while lugging around heavy gear because of the little ankle lockdown. For extensive backpacking you’ll want to invest in a heavier hiking shoe like the KEEN Targhee II. Don’t let bad weather incite you to skip out on camping trips or hikes. With the Hoka One One Women’s Tor Summit WP (and a good rain jacket, of course! ), you can hit the trails anytime, rain or shine. Fashioned with Nubuck leather and suede uppers, these kicks keep it real in nasty conditions by ensuring 100% waterproofing. And it even does it without ever leaving your feet feeling hot thanks to the interior breathable liners. What’s more, the midfoot, featuring Meta-Rocker geometry for maximum foot stability, is engineered to help power your steps through the mud and other tough landscapes. It’s complemented by excellent traction, helping you navigate though all terrains from steep paths to slippery downhill trails. You’ll also love the overall padding around the ankle, making it easy to carry a heavy backpack with no worries. The Hoka One One Tor Summit misfires, however, on aesthetics. It’s slightly unattractive to style-conscious women, and certainly not one of the most stylish of our recommendations. It’s all about speed, support, and natural cushioning with the Oboz Women’s Sawtooth Low. As you can see, the make and styling fit the modern woman who enjoys a healthy lifestyle. Don’t let weekends pass by indoors when you can enjoy morning or evening runs in rain or sunshine. The Nubuck leather upper integrates a unique watertight design for excellent performance on wet days. The underfoot does not lose any support as the triple density EVA footbed sculpts to the arch. Your ankle also receives some locking to prevent unwarranted shifting. You’ll love the nylon shanks and lugged outsoles which keep you stable on rough paths. Pros: O-Fit system does not need breaking in. If you love hitting the road on hot days, the Columbia Women’s Dakota Drifter is a great pick in a waterproof design. It uses a leather and mesh upper to ensure that it remains breathable and comfortable even though it’s watertight. You’ll like the Dakota Drifter’s ability to wick away moisture, keeping the foot environment dry and repelling odour. It is also simple to slip on, thanks to the back pool loop. One of the best features of the Dakota Drifter is the light footbed cushioning. It is a must-have for light walking if you are going to take more than eight hours on the trail. A Techlite midsole absorbs shock while securing your foot in place. Along with it is Columbia’s Omni-Grip, non-marking rubber outsole that carries a heel crash zone. The sizing of the Dakota Drifter feels snug for hikers with slightly wider feet. Other than that it does not need much breaking-in once you find your correct size. Designed to tackle different terrains, the Salomon Women’s X Ultra 2 GTX is the best bet for women looking for good stability in a low-cut shoe. EVA midsoles guide your every step as it cushions and absorbs the impact. You’ll love that the X Ultra 2 GTX can take you through roads riddled with rocks or muddy paths without losing its grip. It’s the perfect remedy for wet environments thanks to the waterproof Gore-Tex liners that keep the foot dry. Alongside is a fantastically breathable polyester mesh that wicks away sweat and resists odours . Even with all its positives, you won’t want to be in too much of a hurry in this shoe. With full ankle flexibility, it’s not hard to roll and ankle if you hit a root or rock. It’s fine for walking and low-impact hiking, but for trailing running, you’ll want to look elsewhere. 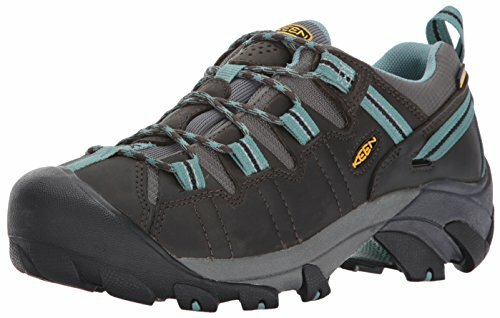 Merrell has revolutionized the way we look at women’s hiking shoes. 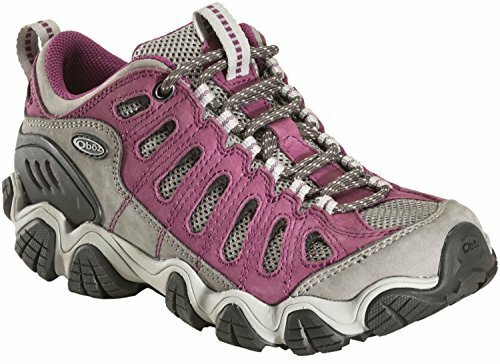 The Merrell Women’s Siren Edge speaks of modernity and style for the keen fashionista. It comes in an athletic-inspired design to support trail runners. Along with the seamless uppers are 3-D prints and ghillie laces. The laces lockdown completely from the front to the ankle to ensure the foot is always planted in the shoe. The Merrell air cushion in the midsole provides heel support while helping to avoid injuries. It’s pleasing to find the nylon arch shanks do not only stabilize the foot but they also prevent plantar fasciitis. The Merrell Siren Edge is synonymous with long trail days since it incorporates a Vibram outsole for maximum durability. The ECO contoured footbed ensures it does not lose your size from the first time you wear it. The Siren Edge is, however, a very light shoe. You’ll need a better alternative to carry heavy backpacking gear. Performance meets comfort in the Salomon Women’s Ellipse GTX. It enjoys excellent waterproofing to take you on long walks over tough elements. If you don’t mind being out on a stormy day playing football or doing some outdoor research, this shoe will keep your feet dry so that you can walk without getting numb from cold. It features Gore-Tex construction with a resilient mesh lining that wicks away sweat. The low-height of the Ellipse GTX is ideal for fast-paced walks as it allows full ankle flexibility. Better still, it favors a responsive ride thanks to the thermoplastic urethane frames on the outsole. You’ll also find the Ellipse GTX suitable for covering rocky paths along streams; its contra-grip technology ensures that it won’t slide perilously on slippery terrain. The Salomon Ellipse GTX does, however, have some issues with the sizing. For some, the shoe runs small; for others, it runs too wide. 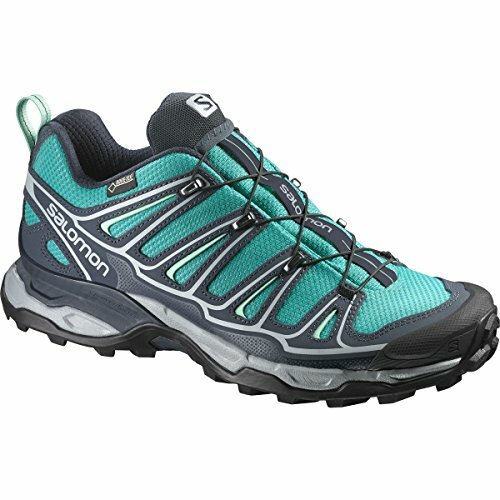 A good rule with these Salomon shoes is to order the size you’d normal wear for athletic rather than walking shoes. If you want all-day comfort when covering serious miles, put yourself into an Adidas Outdoor Terrex Women’s Swift R GTX. 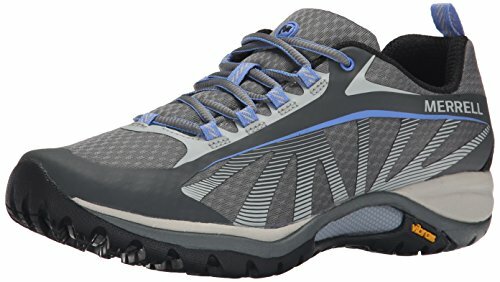 These hiking shoes are one of the best bangs for your dollar, support by its strong waterproof membrane. Adidas incorporates Gore-Tex protection which is not only breathable, but stays waterproof for days. Whether you choose to take a backpack or not doesn’t matter; the ankle is on full lockdown with this shoe. The midsole boasts Adiprene inserts to ensure your foot lands softly while absorbing shock. These kicks also add in a molded sock liner to conform to the curves of the foot for added comfort. You’ll love the playful nature it inculcates in your style, standing out among our top picks with a wide collection of spunky colors and patterns. Ladies with wider feet, however, will find the Terrex Swift R GTX unsuitably narrow. Bright colors and airiness are just two of the elements that make the Ahnu Women’s Sugarpine Air Mesh so unique. It is your sunny day go-to, with an excellent breeze of airflow to cover the hot days. If you favor turning up for trail runs, Ahnu’s got you covered. The Sugarpine Air Mesh is fashioned with a dual-density EVA footbed plus a rubber toe protector to minimize the chance of stubs. Expect a responsive ride and protection from bruising thanks to the shock dispersal plate. You’ll also fall for the Sugarpine Air Mesh’s stability. It uses Numetum Hike Technology to ensure your foot is secure and positioned correctly at all times. Although the outsole of the Ahnu Sugarpine Air Mesh is completely waterproof, this is not the case for the upper. The mesh doesn’t quite cut it when it comes to preventing water from entering the top. Ideal for beating the paths in a mid-version design, the KEEN Women’s Voyageur is a classic. Many women gravitate towards it because of the comfort it brings along. It has a clear balance of leather and mesh on the upper. It’s not fully waterproof, but you’ll be able to withstand a bit of a downpour as long the sneaker does not get full soaked. With the unique in-built shanks, the Voyageur promises a secure ride. Together with the Metatomical foot design, it’s bound to cushion the foot and help prevent injuries. The shoe’s light weight is another bonus, saving a couple ounces in your baggage. 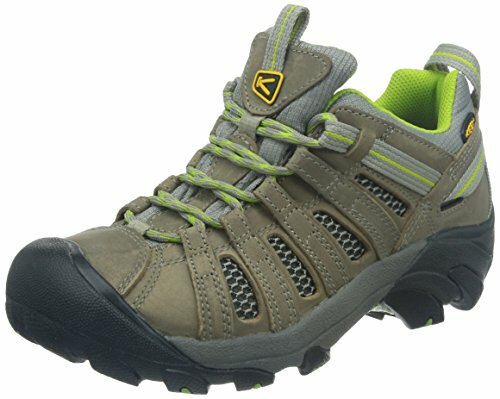 At its heart the KEEN Voyageur is best suited for hiking and walking. You could even take it along for trail runs (although there are better options out there) as it cradles the ankle for a safe ride. The wide box front style, however, does not work well for climbs. Stick to relatively flat areas to get the most out of this shoe. 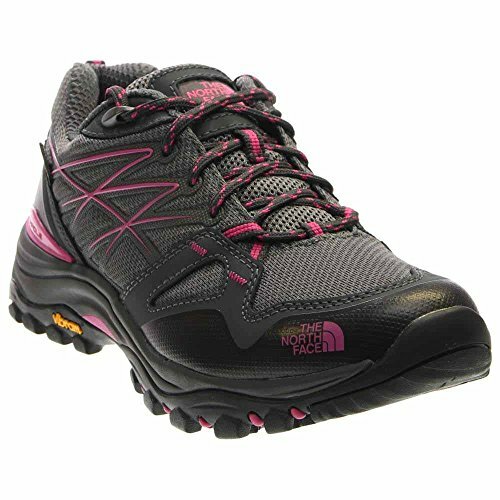 If you are searching for the real feel of a trail trekker, don’t skip out on the KEEN Women’s Targhee II. There’s a reason this shoe has such a huge following. The upper has an ample share of Nubuck leather to assure on its durability. It’s fully waterproof, too, so you don’t have to mind muddy paths aligned with pools and powdery snow. Even with the excellent waterproofing, the shoe also features a breathable membrane, making viable for walks on warmer days. For those that don’t mind toughing out the terrain, the Targhee II is equally at home on well-beaten paths and those replete with roots and rocks. Thanks to the synthetic outsole it withstands heavy usage. It follows through with an EVA midsole featuring KEEN’s Metatomical footbed, providing a fluid ride to propel your foot through each step. The heavy weight of the Targhee II is a bit of a drag for trail runners or minimalist travellers. For something a little lighter, the KEEN Voyageur, essentially a Targhee II without waterproofing, will help you tackle fast-paced runs on beaten paths. Uppers: The top of the shoe covering your foot. The upper is made from any number of materials. 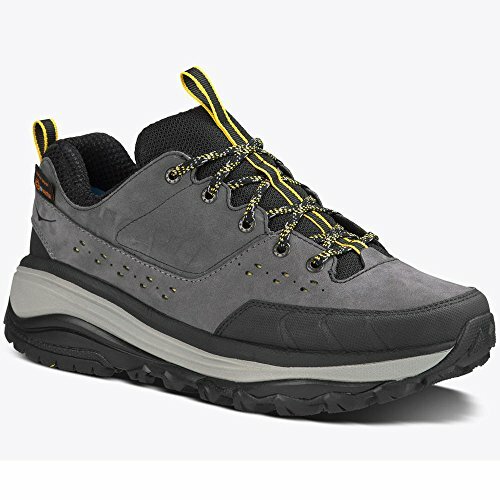 More durable uppers consist of leather while more lightweight hiking shoes use mesh or a combination of mesh and leather. Some feature waterproof membranes to seal water from the shoe. Whichever materials are used for the upper, there’s often a trade-off between durability/watertightness and breathability. Midsoles: The middle section sole where you’ll find the shoe’s cushioning, stability, and shock-absorption features. You’ll hear terms like shank (the support structure between the insole and outsole) and footbed (a more technical term for insole) thrown around quite a bit. Most important in choosing a shoe with a good midsole is to find something that works best with your foot shape and has the right features for your intended use. Outsoles: The outermost part of the sole that contacts the ground. Outsoles are usually made of rubber. The best outsoles (Vibram, for example) provide excellent traction in varying conditions including on wet, slippery rocks. Most outsoles on hiking shoes also showcase lugs, which are small, sometimes multi-directional, rubber nubs that grip onto rocks for better stability on uneven terrain. The most important piece of the puzzle in buying a hiking shoe is deciding how you’ll use it. Each model is designed for a fairly specific purpose. Not all shoes will fit in all conditions. Excellent waterproof hiking shoes, for example, will not only keep your feet dry but also help you maintain traction on wet surfaces. Lightweight hiking shoes, on the other hand, are built for drier and warmer climates where cooling your feet and maintaining breathability is most important. Likewise, you need to think about the support you’ll require. For typical well-groomed hiking trails, most of these shoes will pull off the job. If you’re planning to hike in tougher conditions though, you might be better off with a pair of hiking boots that offers higher ankle support. Even when hiking around with a myriad of travel gear jammed into your travel backpack or over long distances, you may find that these hikers just don’t cut it. 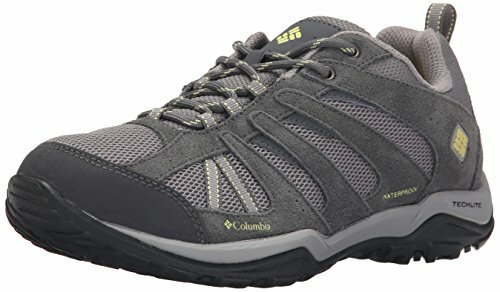 Low-cut hiking shoes work far better for casual day hiking with a light travel daypack (like one of the ones in this guide) than on multi-day hikes with little stopping. Hiking boots are generally more durable and “safer” than hiking shoes, even if heavier, warmer, bulkier and less convenient. Like function, not every hiking shoe is designed to fit the same on all feet. Certain brands are known to use narrower lasts when cutting their footwear, even shrinking the shoe to force you to jump up a size. You may also notice that some companies offer better support and comfort out-of-the-box than others. Merrell and Salomon are often top performers in this regard, constructing their midsoles with plenty of arch and heel support for those with foot problems. Even so, many hiking shoes contain removable insoles to help you upgrade the comfort level. If you need to add custom orthotics, be sure to check the sizing. As custom insoles are often a little bulky, you may need to add a half- or full-size to accommodate them. Whatever you throw in for support, a hiking shoe should follow the same fitting rules as any other footwear. Your toes should be snug, not tight, in the toe box, and your heel should stay firmly planted while you walk. And don’t forget: Before you decide to bring along a new pair of shoes on your next trip, break them in. You don’t want to start walking around abroad to find your brand-new shoes gnawing a blister into your heel!